I would like to know how to clean a dirty Griswold waffle maker that was given to me. I'd like to use it. If it's really nasty, start with oven spray cleaner and seal it in a big plastic bag for a day or two. *Remember to be safe with chemicals and cleaning agents. Handle these according to the manufacture's specifications. Then scrub it down with a wire brush, brass if you have it. I've been known to get impatient and get to really scrubbing too hard, but I haven't seen any negative effects yet. Just get the big stuff off with the hand held brush, then you 'll want to use a brass wire wheel on a battery powered drill to really knock out the tough stuff; you shouldn't hurt it with this. It may be more risky to use a "brass wire cup" and a hand-held grinder, but it works. *Remember to wear all required safety equipment. *Note: Brass is a soft metal and bristles will break and fly off during use on a powered wheel or cup. Also, remember the debris will also be flying and could cause harm. Safety gloves should fit without causing excessive loss of hand dexterity, or usefulness. After thoroughly scrubbing the cast iron, any remaining crud can be soaked in 50/50 vinegar & water for a few hours. Then, the final cleaning should be completed. 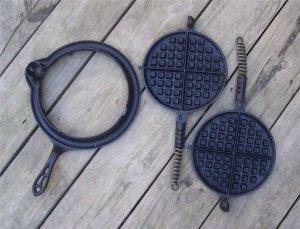 Leaving a bare cast iron waffle-iron in front of you that needs to be seasoned (warmed, baked-in, rubbed down). Start with warming it in the oven at 225F for a few minutes then applying a little shortening, vegetable cooking spray, lard or bacon fat. After you have a good coat on there, replace the iron back in the oven for 30min. Then, wipe the cast iron down with a rag, mopping up pools of oil and spreading them over any dry spots. Replace the Iron back into the oven for another 30min. and re-wipe with your cloth. This time reapply oil to any dry spots, mopping up any pools, and maybe spray with a little coat of cooking oil before you put it away on some paper towels or something, because the iron should be wet with oil, and will soak in some more while in storage. As you continue to use and cook with the cast iron the seasoning will continue to get better with use. Provided you continue proper care for cast iron. Many people say not to use steel-wool when cleaning cast iron, or any really scratchy pads, and even go as far as to say; don't use dish soap. I say use what ever method gets the remnants of the last meal off the easiest. Just keep in mind, you'll have to oil the iron before you store it away. *Remember: Don't leave submerged in water more than 25 hours. No Air-Dying. Don't put it away un-oilled. Personally I would stay away from using oven cleaner (for residue health reasons) and just stick with good old fashioned elbow grease and baking soda paste after soaking in boiling water and vinegar. You might have to do it a couple of times. After it's clean then you want to season it with vegetable oil. Cleaning cast iron skillets can be easy if not allowed to dry hardened for a few days. My way is to put water into the skillet and add Dawn dish liquid or baking soda. Turn on heat and let water mixture come to a boil. I usually boil no more than 3 -5 minutes. Let cool or pour water mix down the drain and start to scrub out stuck on food. Boiled water is very helpful. If the stuck food does not release, try scrubbing with a scrubber or steel wool. If necessary take a knife blade to remaining stuck food. Caution: never leave just water in the skillet as it will rust very quickly. Always oil and or dry thoroughly before putting away. Oh by the way, I have seen iron skillets cleaned by putting into a fire also. It will remove everything from the inside and outside. There is danger of rust to inside and outside until seasoned well again. I love my iron skillet. There are 2 things that baffled me for a long time. How to clean the outside of a cast iron frying pan and get a waffle iron seasoned after being washed. My mom said, "In Scotland we put the frying pan in the fire." works like a charm to take away all the crud from outside. Just re-season by placing oil inside and leaving it in a 200 degree oven for 1/2 hour or so. Apparently a self cleaning oven will do it too. As for the waffle iron that has been washed, or scorched, no fear. Fill it with salt and heat it for 45 minutes to an hour. It can be repeated if necessary. I always have coarse salt left after pickling, afterward I throw the salt on the ice outside if it's winter. Never throw salt on cement though. It eats the cement. This is an algorithm I use for cleaning my cast-iron skillets. As a general rule I never use any soap, detergent or any chemicals. These will not only strip away all of the seasoning, but they will also absorb into the iron and (in my humble opinion) ruin the skillet. I never use water, either, but use oil instead. Water can lead to rusting. Iron is a porous metal and will absorb anything it comes in contact with. The idea is to fill those pores with oil from foods. That is what "seasoning" is. Always clean it while it is still hot to the touch. The heat keeps the food-stuff "soft" and helps it to wipe off easily. I always drain off all the oil/grease left over from cooking and add some fresh vegetable oil. Then use a towel to wipe it out. If it has cooled, simply put it back on the stove or fire for a couple of minutes. This only takes about 30 seconds to do, so you can still enjoy your food while it's hot. That's it, you're ready to go. If that isn't enough, then use something abrasive like salt, dry sand (if you're camping) or a nylon brush. Make sure it's warm and there is oil in the pan. If you use salt, be sure that all of it is wiped out afterward, because salt can be corrosive over time. The above two methods will not remove any of the patina or "seasoning". If they don't work then you have to resort to harsher methods. If the above doesn't work I will use a little oil with a metal scour pad. This will remove a little, but not all, of the seasoning. Afterward, I coat it with a little vegetable oil and put it in a 300-350 degree oven for an hour or two. That will replace the seasoning you took off. You'll be ready to go. I have never had to resort to this, but if that still doesn't work, then you have to start over. Put the skillet in the oven and run a self-cleaning cycle. The equivalent to do if you're camping is to put the skillet face-down on a bed of hot embers and leave it there for about 30-60 minutes. These two methods are sure to remove everything, including all of the seasoning. So, you will have to completely re-season it afterward. To do this just put a light coat of vegetable oil on and put it in the oven at 300-350 degrees for a couple of hours. You'll probably need to do this twice. That will give you enough seasoning so your food won't stick. You'll continue to season it more as you use it. An important note: if you use the camp-fire embers method, be sure to heat your skillet first before putting it on the embers. Just kick a few embers off to the side and put the skillet on them. Then when it's hot, put it face down on the ember bed. If you put the skillet on the embers while it's cold you can warp the skillet or crack it. If the skillet warps, the cooking surface will be uneven and oil will drain off of certain parts while you cook leaving them bone-dry. This will cause food to stick to those parts.